What do plastic seahorses, pipe cleaners, and feathers have in common? They can all be used to facilitate developmentally appropriate learning experiences! Developmentally appropriate practice (DAP) has become a fundamental tenet of early childhood education in the United States and while some foundational similarities exist across borders, best practices are fluid concepts that derive much of their meaning from the cultural context in which they reside. Consequently, countries around the world face their own unique challenges in ensuring equity and quality. China has invested to expand the scope and capacity of their early childhood education sector as demand increases, but a large divide in resources and access remains between rural and urban areas. Additionally, rapid privatization of preschools has resulted in parents paying large sums for high-quality learning, often leaving those that can’t afford to behind—not unlike trends we’ve seen within the United States. As educators and systems administrators look for guidance and professional development both at home and abroad, NAEYC hopes to provide opportunities for training and promote best practice around the world. With a population of almost 1.4 billion, across-the-board quality and access remain two of China’s greatest challenges in preprimary education. Chinese children typically spend one to three years in preschool or kindergarten, with the types of centers ranging “from nursery . . . and seasonal kindergartens in poorer areas of the country to top-notch pre-primary education.” In 2016, China partially lifted restrictions on its one-child policy, adding additional demand and stress on their educational systems; studies predict a “shortfall of 11,000 kindergartens and 3 million kindergarten teachers by” 2021. Another major challenge to preprimary education across China is posed by the continued flow of migrant workers to urban settings in search of work. These migrant workers often face the dilemma of whether to bring their children with them or leave them at home with relatives. There are an estimated “69 million left-behind children” who do not always have access to early education as only 32 percent of the 590,000 villages in the country have a kindergarten. However, interventions have been made to bridge the gap. Tapping into the country’s strong societal focus on family values, projects have increased public funding for new schools while empowering at-home caregivers—namely grandparents—to provide educational opportunities for their children with the aid of home-visiting teachers. Privatization and childcare franchises have also become commonplace in China, sometimes seeming to run counter to government regulation efforts, and has raised questions regarding what constitutes quality at early care centers. New cabinet-level guidelines have promised government investment into public early childhood education and placed restrictions on private kindergartens, but the majority of centers remain privately funded with wide-ranging, unstandardized curricula. “China in 2017 had around 255,000 kindergartens, [only] 37.1 percent of which were public. Moreover, 79.6 percent of children aged 3 to 6 attended kindergarten last year.” Serving such a large swath of China’s children, it’s vitally important that these preprimary companies and franchises are informed about and implement best practices, and that they are working to provide accessibility to lower-income families, not just to the wealthy elite or those living in urban areas. China’s abundance of private preschools and kindergartens has served to widen the economic divide, but also highlights growing professional needs as demand for more teachers increases. 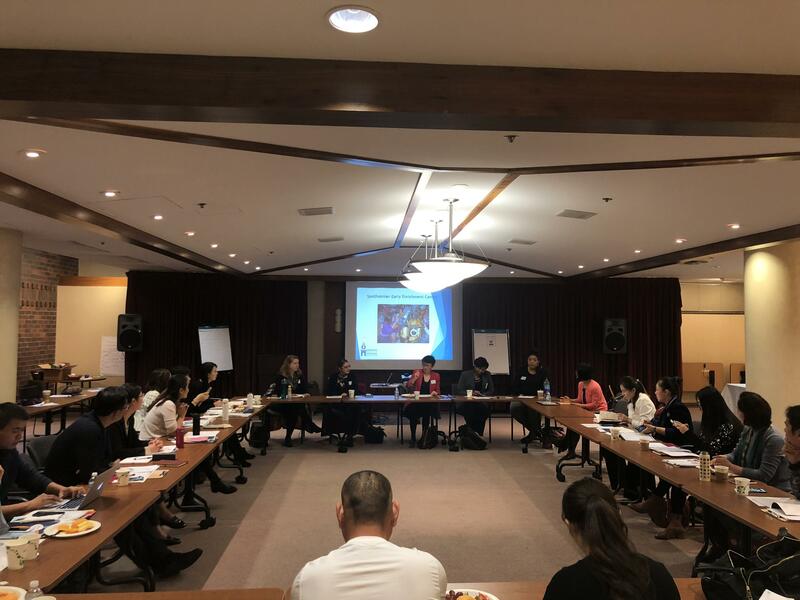 As China and other nations around the world move to incorporate DAP into their early education approach and advance the capability of their workforce, NAEYC has developed customizable trainings to address the needs of early childhood education professionals from diverse backgrounds. These trainings reflect our core values and empower participants to recognize and implement culturally-appropriate and adapted best practices, ensuring that children will receive appropriate care and guidance during this integral stage of their development. 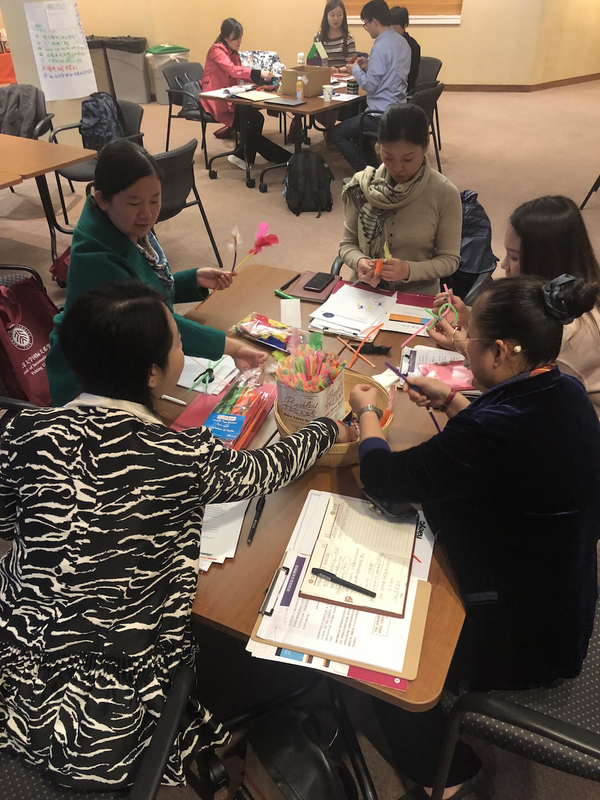 This past fall, a group of teachers, directors, and investors from China engaged in a weeklong, extensive training on DAP and equity at NAEYC’s headquarters. NAEYC’s professional development team facilitated the group’s hands-on activities and visits to the Smithsonian Spark!Lab and to early childhood programs around DC. What makes this play area appropriate for very young children to explore? What kinds of questions could a teacher have asked you as you drew your self-portrait? Later, hands-on activities and classroom observations helped participants explore developmentally appropriate classroom materials and lessons. As an introduction to DAP, participants cycled through stations covered in materials (ranging from cornstarch and plastic seahorses, to magnetic blocks) and were asked which table they spent the most time at and why. The majority pointed to a table covered in miscellaneous art supplies—pipe-cleaners, feathers and pom-poms—where they had produced bracelets, bunny ears, eyeglasses, and towers. This station allowed for a wealth of creative exploration and teamwork with little intervention from the activity leader, who mainly asked guiding questions. 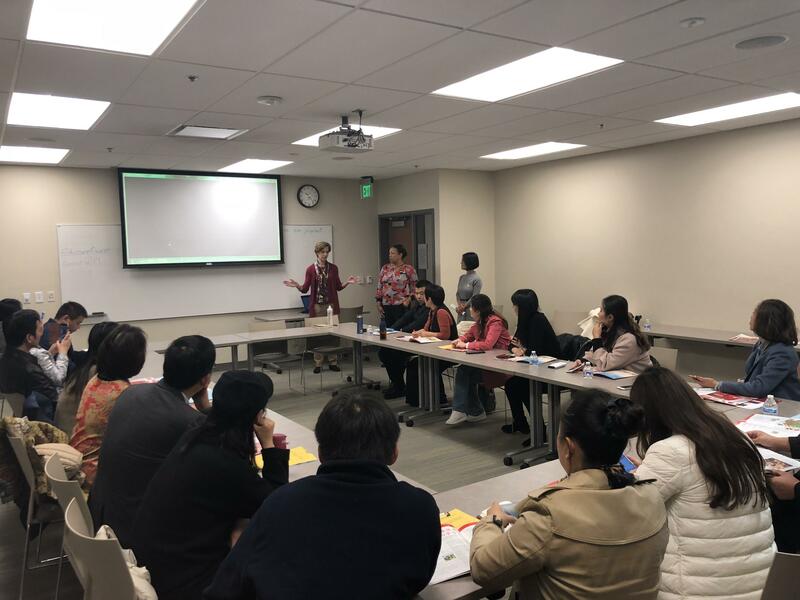 These activities were paired with lectures and site visits to diverse programs in and around DC, including Educare Washington, DC, the Smithsonian Early Enrichment Center, and School for Friends, where the Chinese visitors observed operating and empty classrooms. Of particular note, cotrainers Dr. Nili Luo, from Southwestern College in Kansas, and Dr. Lea Ann Christenson, from Towson University in Maryland, continued the conversation on DAP while tackling diversity and equity and its applications in early childhood, discussing the need to recognize and value diversity in classrooms and to provide equitable access to learning through an approach that assesses the needs of each individual child. At the end of the week, they participated in a lively panel discussion with local center directors and administrators from Head Start and DCAEYC. Participants said the training helped them “gain practical skills” and that the week encouraged “deep thinking” and “self-reflection” regarding their teaching strategies and their knowledge of what constitutes high-quality early learning. As the demand for quality early childhood education grows in China and around the world, we hope to further collaborate with professionals seeking examples of high-quality early childhood education, learn from others about their own innovative approaches, and build professional networks to advance the profession globally. Interested in learning more about more professional development opportunities at NAEYC? Contact us at global@naeyc.org; we host customizable trainings in a variety of languages in the United States and also facilitate them abroad.